Cameron County Commissioner David A. Garza is the latest recipient of the Texas Department of Transportation Road Hand Award. This honor is a TxDOT tradition to acknowledge those who have made major contributions to improving transportation in their community and in the state. Commissioner Garza is the secretary-treasurer of the Alliance for I-69 Texas and a long-time member of the board. He has been a consistent champion of I-69 for the past decade including making dozens of appearances before the Texas Transportation Commission to keep the spotlight on the fact that until 2013 the Lower Rio Grande Valley was the largest metropolitan area in the nation not served by the Interstate Highway System. 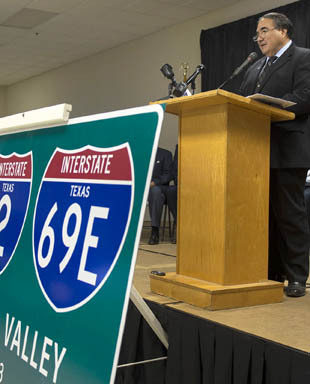 Commissioner Garza, along with other leaders of Cameron County and Valley communities, worked with TxDOT, state lawmakers and members of Congress to convert US 77 and US 83 to freeway standard and to push successfully for legislation to allow these completed I-69 system sections to be added to be designated as interstates. They also formed the Cameron County Regional Mobility Authority and have moved forward with construction of State Highway 550 to create a more efficient and safer link for commercial trucks between US 77 and the Port of Brownsville. SH 550 is part of the congressionally designated I-69 system in Texas. Garza’s Precinct 3 includes San Benito, Los Fresnos, Port Isabel and Rio Hondo. In addition to his county duties he is a pharmacist who has operated the Medicine Shoppe Pharmacy in San Benito for three decades. The Road Hand Award was created in 1973 by former State Highway Engineer Luther DeBerry. He recognized that TxDOT owes a great deal to its many friends and supporters for their efforts to make the Texas highway program the best in the world. The award is the highest tribute to citizens who freely give their time, energy and vision to champion transportation projects. The names of Road Hand recipients are inscribed on the Road Hand Hall of Honor plaque, which hangs prominently in the foyer of the historic Dewitt C. Greer Highway Building in Austin. Garza joins more than 200 people who have been named Road Hands since its inception, including this year’s four other recipients from around the state. Cameron County Commissioner David A. Garza is an I-69 champion from the Lower Rio Grande Valley.